We'll stick with Kwanzaa, thanks (meetup). 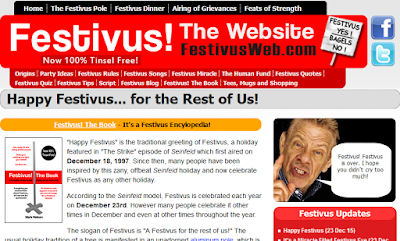 "Happy Festivus" is the traditional greeting of Festivus, a holiday featured in "The Strike" episode of Seinfeld. People have been inspired by this zany, offbeat Seinfeld holiday ever since and now celebrate Festivus like any other holiday. According to the Seinfeld model, Festivus is celebrated each year on December 23rd, but many celebrate it other times in December and throughout the year. 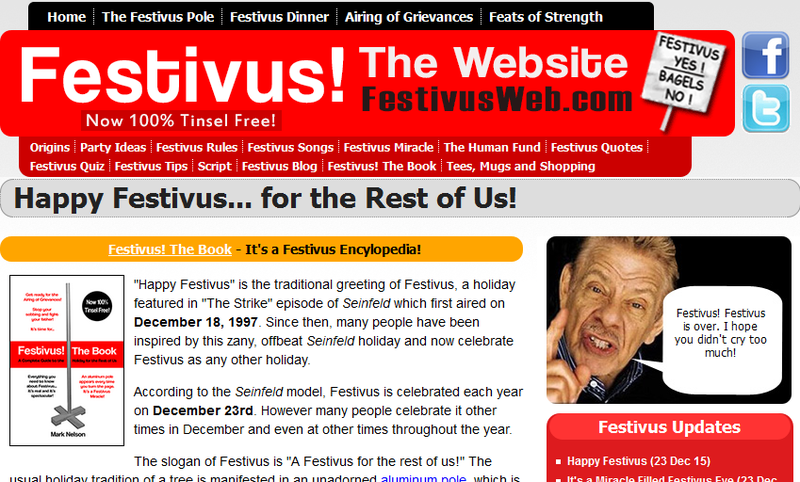 The Festivus slogan is "A Festivus for the rest of us!" The usual holiday tradition of a tree is manifested in an unadorned aluminum pole, which is in direct contrast to normal holiday materialism. Those attending Festivus may also participate in the "Airing of Grievances," which is an opportunity to tell others how they have disappointed you in the past year. This is followed by a Festivus dinner and is completed by the "Feats of Strength," where the head of the household must be pinned down. All of these traditions are based upon the events in the Seinfeld episode. (Incredible Black, Part 1 of 2) Here's how to celebrate the new universal holiday Kwanzaa. Looking for a new holiday tradition? The Seven Days of Kwanzaa run from Dec. 26th to Jan. 1st. It's open to all. How can we celebrate it? Let's do something that connects us back to Mother Africa and seven core cultural principles that were once commonly honored. Kwanzaa is an African-American and Pan-African holiday celebrated by millions throughout the world in African communities. Kwanzaa brings a cultural message that speaks to the best of what it means to be human and African in the fullest sense. Given the profound significance Kwanzaa has for African-Americans and, indeed, African communities throughout the world, we need a reliable source of information on it. Is everyone just copying Europe? 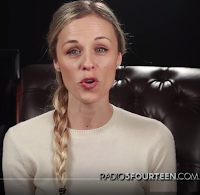 WARNING: In her enthusiasm to celebrate European culture and Yule, Lana says some very offensive things that could make one wonder about her motives, implicit bias, white privilege. In the multicultural West we are told to say "Happy Kwanzaa," "Happy Hanukkah," ["Happy Festivus"], and "Merry Christmas" or these days just "Happy Holidays" so as to not offend others. Lana talks about the true origins of newcomer holidays such as Afrocentric Kwanzaa and Jewish Hanukkah. 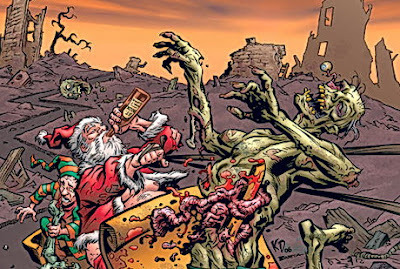 Where did these holidays originate? Are they original or copycats? Why are they also in December, like Christmas? Let's learn about the true origins of Christmas, which is entirely borrowed from Yule, the pre-Christian [pagan] European celebration of the Winter Solstice in the Northern Hemisphere. We stole soul, jazz...but you stole Kwanzaa. Christmas, Hanukkah, Kwanzaa [and Festivus] are all impostors, culturally appropriating from the ancient European Winter Solstice celebration. [But, Lana, was "Yule" a rip off of ancient Roman Saturnalia, which took most of what it celebrated from ancient Greece, which stole most of what made it famous from ancient India, which borrowed most of what made it great from the Indus Valley Civilization... No, probably not. It's easy to be Eurocentric. But the world is much bigger and much older than Europe. People all over the planet celebrate in winter, which is when we most need to cheer up, get along with one another, and survive the cold. So, please, Ixnay on the racismay, Eva]. Let's learn about the myth, symbolism, and tradition of Yule.